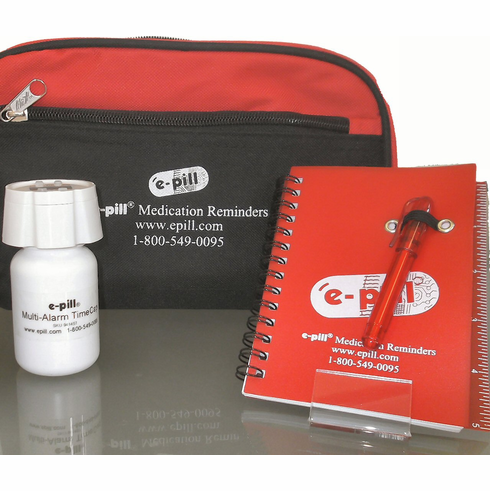 Blood Pressure Medication Pill Reminder, BP Log Book and Carrying Case. World's first and only clinically proven Hypertension Management Kit / BP Monitoring Kit. Easy to use Hypertension Kit for Home use comes complete with Blood Pressure Pill Reminder ("alarm cap"), Pill Bottle, BP Log Book ("handy notebook with pen") and a practical Carrying Case ("keeps everything in one place"). Clinically proven to reduce your blood pressure more than your blood pressure medication alone can do! The carrying case keeps your BP medication and gear in one place. Great for Travel or Home use (Anti-Hypertensive Pills NOT included / Blood Pressure Monitor NOT included). Take control of your high blood pressure today and order your e-pill Hypertension Kit. 30 Day Money Back Guarantee. One Year Warranty. Order your hypertension kit today. FREE Standard Shipping. Hypertension Kit to help Remind you take your blood pressure pills and Record your Blood Pressure. Use your own BP monitor to measure your blood pressure on a daily basis (BP monitor not included in kit). Complete with e-pill Medication Reminder (alarm cap) for your Blood Pressure pills, Blood Pressure Log Book to record and communicate your treatment progress with your healthcare professional, and Carrying Case. An empty pill bottle is also included in case the pill timer does not fit on your pill bottle. | Order more e-pill Timers | Learn: Clinically proven to reduce your BP more than your pills alone can do! Pill Reminder with Alarm. Never Forget to take your blood pressure medication(s) again (included). Note Book with Pen. Record your blood pressure (included). Use your own BP Monitor (not included). Practical Carrying Case for home or travel (included). Hypertension Kit to Remind you to take blood pressure medication (once or twice daily) and Record your blood pressure readings (to bring to your doctor appointments). Easy-to-Use hypertension management kit for home use includes; clinically proven e-pill Reminder (e-pill Multi-Alarm TimeCap SKU 941457), Blood Pressure Log Book with Pen, Carrying Case with room for your BP Monitor (BP Monitor NOT included). Never forget to take your anti-hypertension pills and monitor your BP again! e-pill Medication Reminder (included). Super-Easy to Use. Hypertension Kit (High Blood Pressure) Easy-to-use Monitoring Kit for managing your Blood Pressure from e-pill Medication Reminders; Pill Reminder for your blood pressure medications, Log Book and Carrying Case (with room for your blood pressure monitor). Clinically proven to reduce your blood pressure more than your blood pressure medication alone can do! Take control of your BP today and order your e-pill Hypertension Kit. Size (carrying case): 10 inch x 5 1/2 inch x 4 inch Weight: 10 Oz.